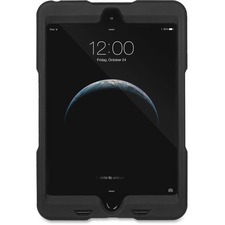 Blackbelt 1st Degree Rugged Case surrounds the iPad mini in a strong, cushioned layer of rubber for all-around protection against drops and scratches. The rubberized texture makes the case easier to hold and prevents it from sliding off a table or desk. Strategic cutouts allow you to easily use all of the tablet's buttons, ports and cameras. A raised bezel protects the corners and screen from scratches and damage. Case fits into charging cabinets (sold separately) with bays 20mm and larger. 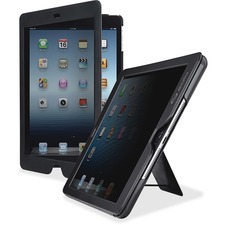 Privacy case keeps your iPad Air's on-screen information confidential for confidential use in high-traffic areas. Unique construction darkens the screen when viewed from the side. Protective layer keeps your screen protected while providing flawless touch-screen accuracy. Magnetic cover automatically puts your iPad to sleep when closed and wakes it up when opened. Convenient kickstand allows viewing in landscape mode on flat surfaces. Front and rear camera openings allow you to shoot photos without requiring you to remove your iPad from the case. Sleek, snug sleeve is designed specifically for the BlackBerry Curve 8300 Series. Forming an unobtrusive fit with your phone, the sleeve also acts as a protection to guard against accidental drops and scratches. 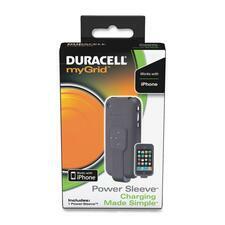 Fitted with a Power Sleeve, your device can be easily placed onto a Duracell myGrid Charging Pad (sold separately) for drop-and-go charging without any hassle and without any cords between the devices and the charger. Sleek, snug sleeve is designed specifically for the Apple iPods. Forming an unobtrusive fit with your phone, the sleeve also acts as a protection to guard against accidental drops and scratches. 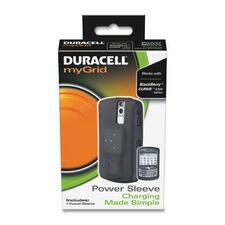 Fitted with a Power Sleeve, your device can be easily placed onto a Duracell myGrid Charging Pad (sold separately) for drop-and-go charging without any hassle and without any the cords. 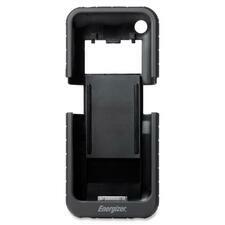 Charging sleeve helps you easily charge your iPhone 3G/3GS on the innovative Energizer Three-Position Inductive Charger (sold separately). Slide your iPhone 3GS/3G into this Qi Inductive Charging Sleeve and place it onto the inductive charging pad for easy wireless charging. The charging sleeve is so lightweight and slim that it can be left on your device. Versatile Data Bank features an easy-to-read calendar, daily schedule alarm, calculator and a telephone book that saves 100 sets of names, telephone numbers, email addresses and fax numbers. 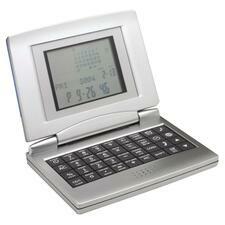 Compact organizer offers the time in 32 world time zones as well as exchange rates and unit conversions. Housed in striking brushed metallic and translucent blue case. Battery included.